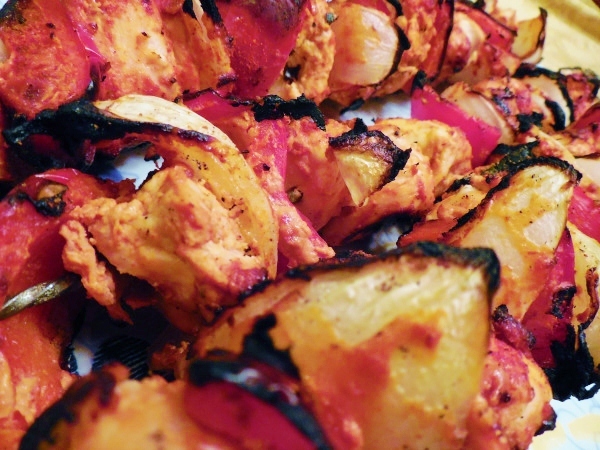 …and whatever other veggies you like on kabobs! 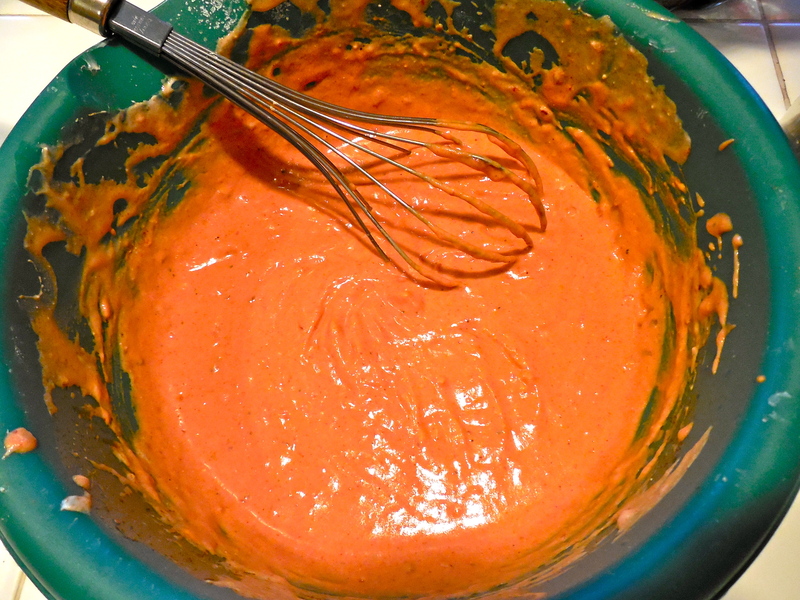 Mix the paprika and chili flakes together in a large bowl – add about 1 Tbsp. of hot water to form a thick paste. Let that leech out the flavors for a few minutes while you chop your chicken into bite-sized pieces and slice your lemon into thin rounds. 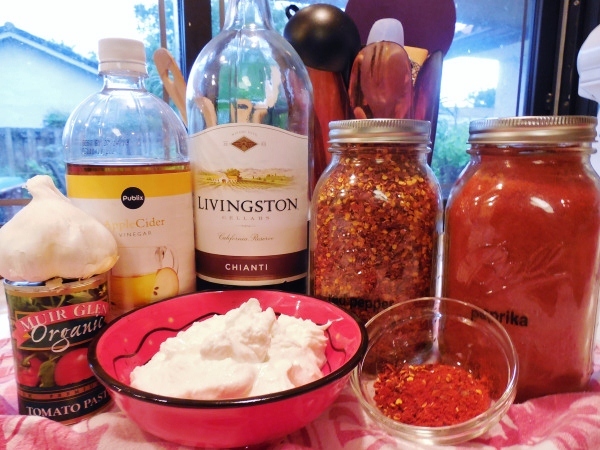 Mix all the other marinade ingredients together, tasting to see how much salt is needed. this is the beautiful color we want! Throw in your chicken and lemon rounds. Allow this to marinate for at LEAST 2 hours – can be done a day ahead. …take your chicken out of the fridge and allow to come to room temperature. Preheat your grill on HIGH. Chop up your veggies so that they are skewerable (is that a word?). Thread alternating bits of chicken and veggies onto your skewers – try to get some of the marinade off, but SOME trapped in between chicken pieces really gets this juicy and tender so don’t worry too much! Little side note here – I was looking up some skewers on amazon.com since mine are getting a little long in the tooth, and I found these neat little things. They would definitely make this meal much less messy to prepare – chalk that up to another food related expense on my card! 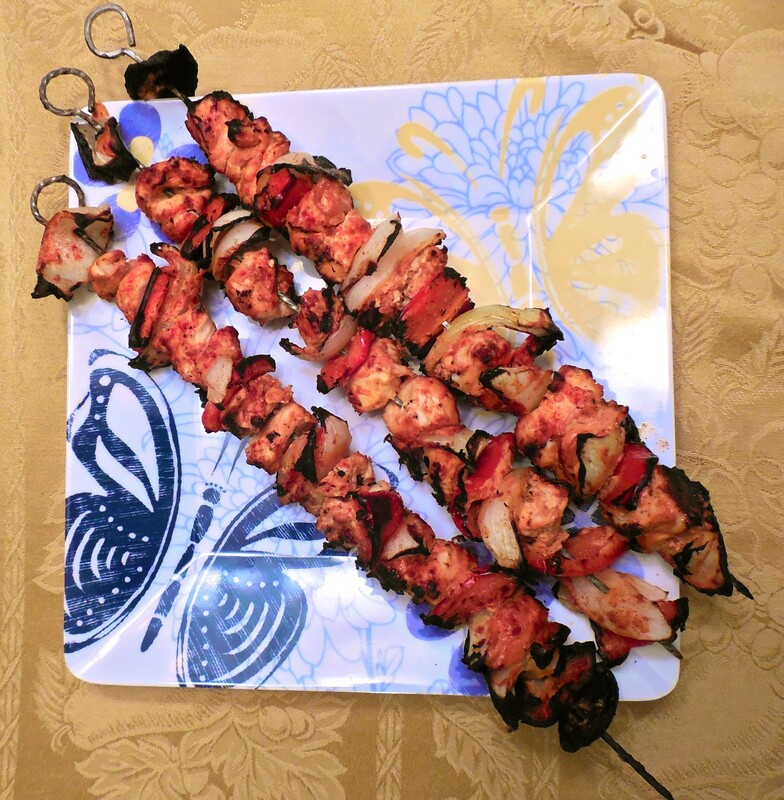 Once your hands are all messy and the skewers are ready, place on the grill and leave open – you’re wanting to char the edges of the veggies and chicken a little. Let that grill for about 10-15 minutes, turning and sprinkling with the paprika and red chili flakes (easy on those!) Serve with rice and some lemon wedges! Due to the spice in this, I’d suggest a sweeter white to balance. Since I usually “outsource” my wines, why not throw in a little melting pot action here and go for an American wine? 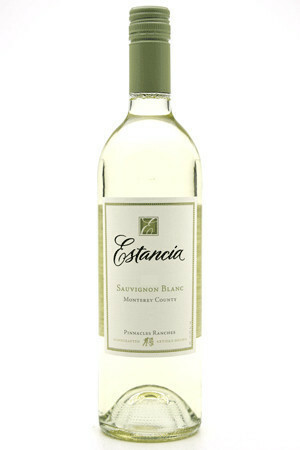 Estancia Sauvignon Blanc from Monterey, around $13. The nose of orange blossoms melds beautifully with the richness of the yogurt and spice in the dish, finished off with a bite of lemongrass that beautifully compliments the lemon flavors infused into the chicken. Serve chilled! Echo, I just want to tell you how much I enjoy your posts on food. You have come a long way to being an active carnivore with an adventurous palate. I sure wish I was back your way as I would love to be one of the people eating your creations. Everything you have posted sounds sooooo good. You are also very talented in your writing skills. Might be a future in that for you? Although, I believe you could do anything you wish to. You are so smart and ambitious. Hugs sweetie! Just made these the other night and thought it was worth a re-post – SOOO good, everyone loves them!